A City Council committee yesterday delayed a vote on a natural gas franchise agreement between the Pugh administration and Baltimore Gas & Electric after critics said the deal vastly shortchanges the city for the loss of parkland. 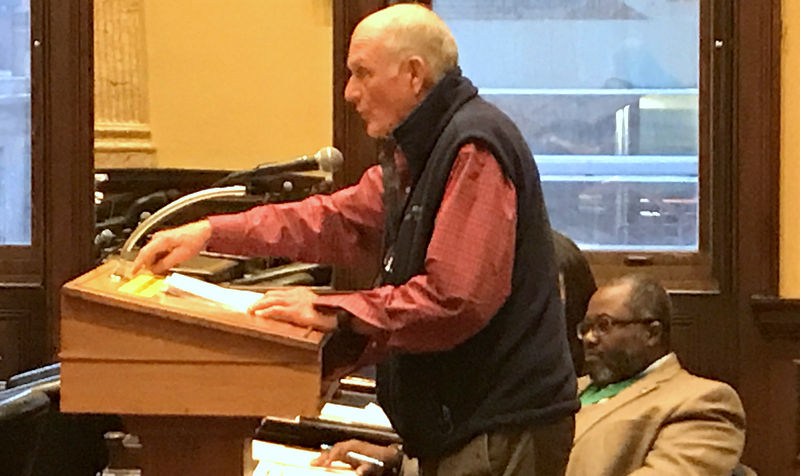 Council President Bernard C. “Jack” Young questioned why the city would agree to a lump sum payment of only $1.4 million in return for a project that has destroyed 19 acres of pristine woodland. “This is the best deal you could have gotten from BGE/Exelon?” Young said, addressing city lawyer Victor Tervala. BGE originally wanted to pay the city $100,000 for the 25-year franchise, Tervala said, while the Department of Recreation and Parks, which owns Leakin Park, was “very vociferous” about wanting substantially more. BGE eventually agreed to pay $2.1 million in installments over 25 years. This was reduced to $1.4 million when BGE agreed to make a single payment now. The lump-sum figure was approved by the Finance Department, Tervala said. Young argued that, at very least, the city should get the full $2.1 million upfront in return for Council approval of the franchise. “$2.1 million is ridiculously low,” countered George Farrant, vice president of the Friends of Gwynns Falls/Leakin Park. At minimum, the city should get $9.7 million based on a recent national study that put the value of urban land between $511,000 and $1,200,000 per acre. “Franchise agreements for access under city streets are different than agreements through a park,” he said. Streets can be repaved, but Leakin Park, which he described as the second biggest “urban wilderness park” in the country, cannot be restored to its original status. 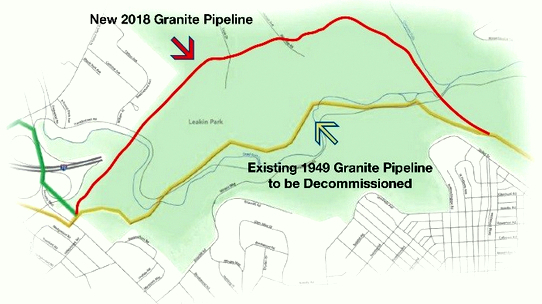 When completed, the new pipeline will carve out a 50-foot-wide swath of land across two miles of the park, replacing a 1949 pipeline on a different alignment. The land will remain devoid of trees or heavy brush so that the pipeline route can be inspected from the air. Farrant called on the Council to demand a third-party, independent review of the proposed franchise. Reginald Moore, director of Recreation and Parks, defended the agreement. BGE did not offer any public testimony. With additional questions raised by Councilmen Kristerfer Burnett and Bill Henry, committee chairman John Bullock announced that action on the franchise bill would be delayed for at least two weeks. Bullock asked Tervala to provide the committee with more information about the rationale for the negotiated price. Bullock told The Brew that the new information would be made public. 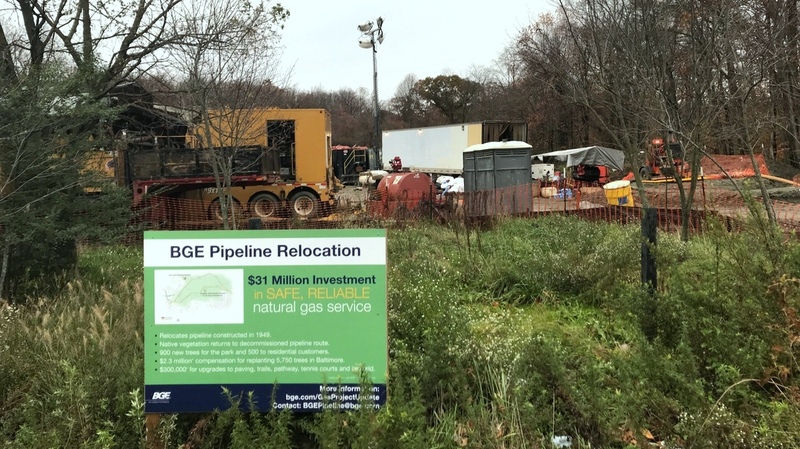 The project will restore a section of BGE’s Granite Pipeline that transmits natural gas from interstate sources to a terminal in South Baltimore. The line supplies 90,000 customers in Baltimore city and county. Last year, the Pugh administration approved construction of the 26-inch pipeline through Leakin Park. To avoid environmentally sensitive wetlands, BGE choose a northern route through the park that has resulted in the removal of 700 trees, a sizable number of which were mature poplar, red oak and white oak. To compensate the city for 11,345 inches of tree loss, BGE agreed to pay $2.6 million, half before the start of construction and half after the city signs the franchise agreement. The company also has allotted $209,000 for the restoration of a nature path, a ball field and tennis courts destroyed by construction. The park now contributes significantly to Baltimore’s 28% tree canopy – which is below the goal of growing a tree canopy enough to cover 40% of the city. In recent years, Leakin Park has been beset with floods, exacerbating maintenance problems caused by an inadequate Rec and Parks budget. “We hope you will champion monetary changes appropriate. . . for the permanent devastation in one of the East Coast’s most valuable parks,” they wrote. A review of campaign contributions by The Brew shows that BGE and its parent companies, Constellation and Exelon, were active donors to Pugh’s 2016 campaign. In the primary season alone, Pugh picked up $18,500 in contributions from 30 executives, mostly in $500 increments. Among those contributing more were Calvin G. Butler Jr., CEO of BGE ($1,000); Frank Kelly, BGE manager of diversity ($1,000); Joseph Nigro, CEO of Constellation ($1,000); and David Vahos, BGE treasurer ($750). Yesterday Butler, a resident of Cockeysville, was named co-chair of Baltimore County Executive-elect “Johnny O” Olszewski’s transition team.